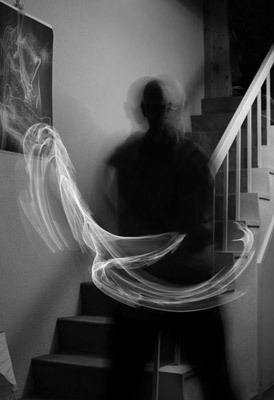 Many people have commented that these light paintings emanate a musical feeling. Whenever I make them I experience the exact same energy that I get from my musical improvisations – only the tools are different. The moment of creation, whether it be the tai-chi dance of a camera before a flame, or the shiatsu dance of hands over a keyboard, is identical. They are both a balancing act out there on the high tightrope between chaos and control. When I was a young teenager at school in London, I avidly studied a scientific textbook simply entitled Heat, Light and Sound, and was impressed to learn that sound and light are part of the same continuous spectrum. My initial scientific interest soon led me to the two parallel artistic roads on which I have travelled all my life – music and photography. Almost by chance, my musical career became the more prominent one, due to a #1 hit by my first band when I was 18 years old. After nearly two decades of musical experimenting, from soul to progressive rock, punk rock to meditation music, I moved to Japan in 1985. Inspired by the apparently contradictory elements of cutting-edge modernism and deep spiritual tradition in Japanese culture, my creative journey became more focussed, both in visual art and in music. The new digital technology enabled me to sample sounds, analyse them microscopically and transform them. At the same time, the acquisition of high quality macro lenses allowed me to approach my subjects (for example, the interior of flowers, rain on garbage bags, rust on signposts) closer and closer until the forms became as abstract as sound waves. At a certain point, the echoes, the spaces between the notes started to have more significance than the notes themselves. It now seemed that the ideal to which I should aspire was to improvise music that would lead myself and the listeners to a silent state of grace and heightened awareness. Likewise, in the increasing formlessness of my photographs, the pure light spoke more to me than the objects from which it was reflected. I became inspired by the feeling that life is a divinely-inspired play to immerse oneself in, rather than an agonising riddle to be solved. The attentiveness to tiny accidents, chance happenings, invitations to go beyond my plans and concepts, became the key. One night I tried to take a photograph of Christmas lights, and accidentally moved the camera during the long exposure. The resulting trails of light looked more like a painting than a photograph. This could have been considered as a mistake, or at best a charming random occurrence, and left at that. But over time this has become the only form of photography which deeply interests me, and I have devised numerous ways to refine this technique of creating images in the camera. The principal approach is the movement, during the exposure, of the camera, or the light source, or both. The light sources may be natural (a full moon, sunlight reflected on water, or refracted through foliage) or man-made (city lights, car lights, candles, flashing LED’s). Since I moved from film to digital technology, the computer has come into play, but only for cropping or adjusting colour balance. Regarding titles, I felt that they should not limit people’s personal interpretation of these light paintings. “Untitled” may be the best solution, but I find it a little drab – and how to refer to a particular image? As a homage to the country in which I developed this form of art, I decided to categorise the images using Japanese words that have some connection with the light source. For example, two of the categories are Shindo (meaning vibration, as in the rapid movement of tungsten filaments) and Tamashii (soul, referring to the “light-being” appearance of some plasma lamps). I dedicate these light paintings to all the pioneering abstract photographers and artists who have inspired me with their visual music, and to the immortal light that shines within us all.